A few weeks ago, I made a little “in the meantime” piece because I had “nothing” to work on in the evenings–no handwork. Since then I have embraced the kantha blanket, and have begun the long journey of repetitive stitching that I had planned for it. And then, I finally bit the bullet and started a new project that I had been mulling over since last December. Can you guess what it is? I am doing a quilt of “The Hallelujah Chorus.” It has long been one of my favorite pieces of music. When I lived in Texas, our church choir sang it, and we were required to memorize it. The words are magnificent, and have so much meaning to me. I had the idea when I went last December to a beautiful cathedral in downtown Sacramento for a performance of The Messiah. My little idea was that the quilt had to be extremely beautiful, mostly white, with perfect extensive quilting, and of course, the words would be preeminent, and of course beautiful calligraphy. Hmmm. See why I was afraid to start it? A little thought came along–why don’t you do what you know you can do well? 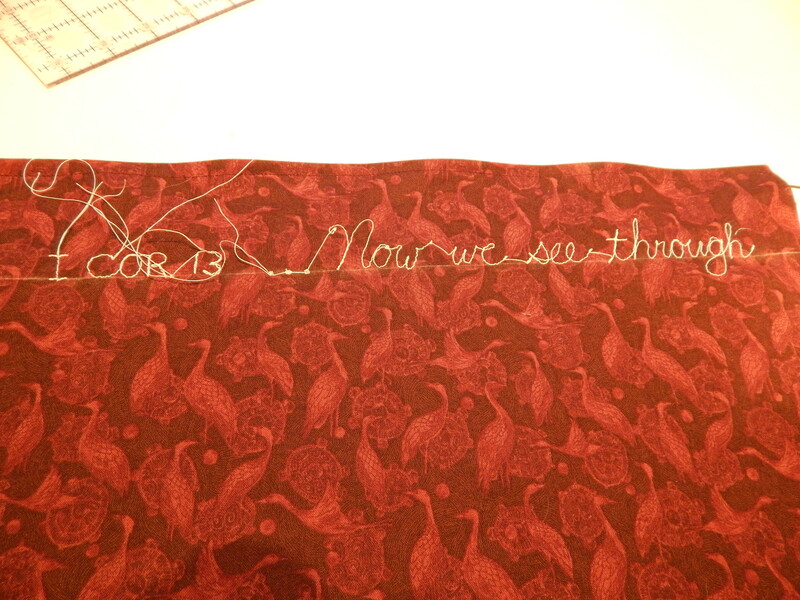 So I decided to use my own handwriting, and to make my circles with embroidery. I bought some silk-type fabric at Joann’s to practice on, and it turned out that I really liked this fabric, so I stuck with it. I wanted the piece to be a bit larger than most of my embroidered works, so I came up with the idea of doing the circles and the words in separate panels, and then after all of them are embroidered, I will join them into one quilt top and add more quilting. All I can say is, you just have to try. It very well could have been that these things would not have worked. Heck, they still might not work. But by trying, even if I fail, I have learned something new. I first saw words used as a “quilting motif” in a lecture by John Flynn. I was fascinated! I think I’ve always liked putting words in my needlework (I used to do a lot of counted cross stitch.) So looking back, I can see that putting words on my quilts was a natural evolution. 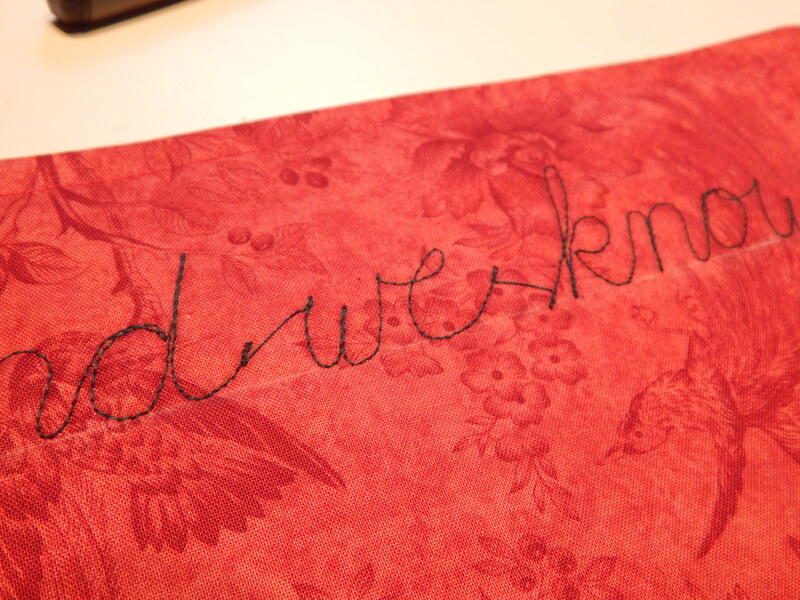 Writing is one of the things that is easiest to do when you first start free motion machine quilting. Think about it–its one of the things you are the most familiar with drawing–you’ve been doing it your whole life! I usually start by printing out the verse on a piece of paper. 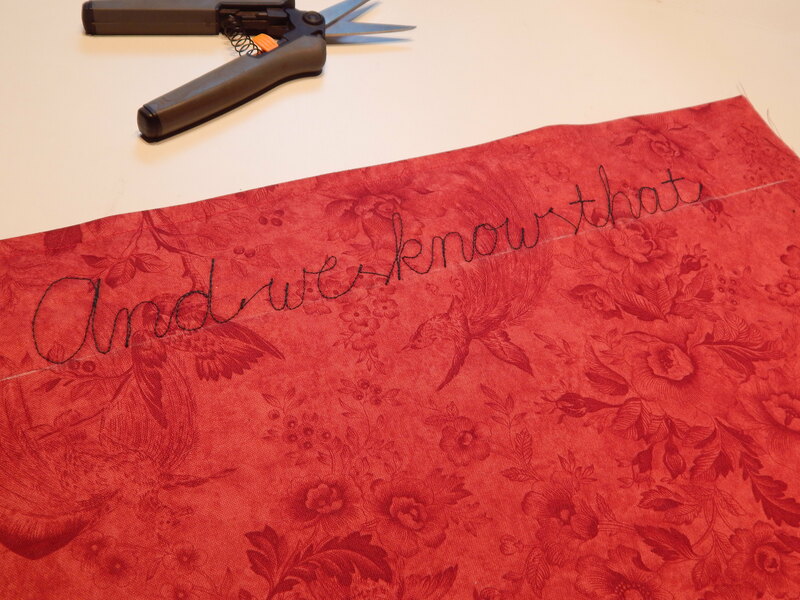 I measure the area where I plan to place the words on the quilt, and divide to see how many lines I can put in that area. Then I count the words and see how many letters I need to put on each line. This is all approximate, because sometimes my writing comes out differently than I had planned. Then you can do just like they do in books–crowd the writing to make it all fit in. 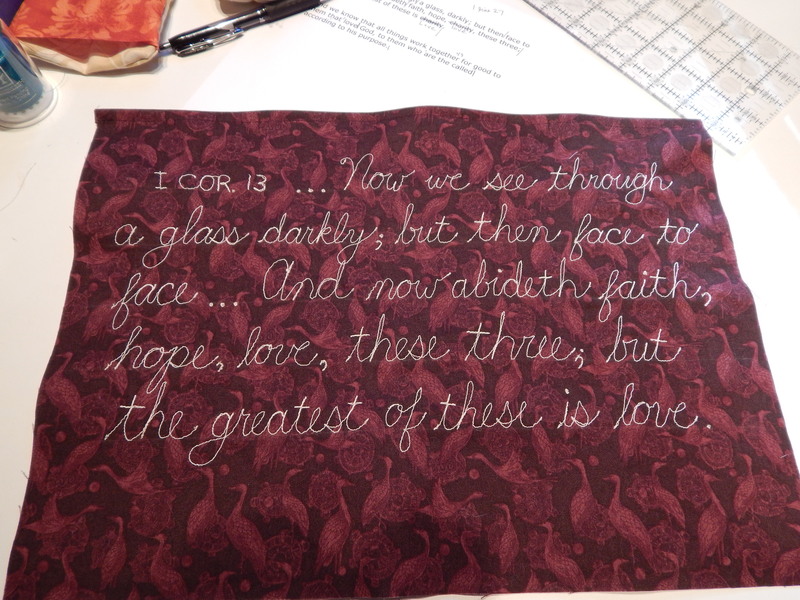 Here you can see how I backstitch at the beginning and end of each word. Then I just lift the presser foot and move to the place where I want to start the next word. After I am done with a line, I take those little snips and cut the threads right next to the stitching. Another view, where I started and stopped more frequently, so there are more dangling threads. I always start by bringing the bobbin thread up to the top. In this view, you can see the chalk like that I drew to keep the writing straight. I do this especially when the writing is larger. 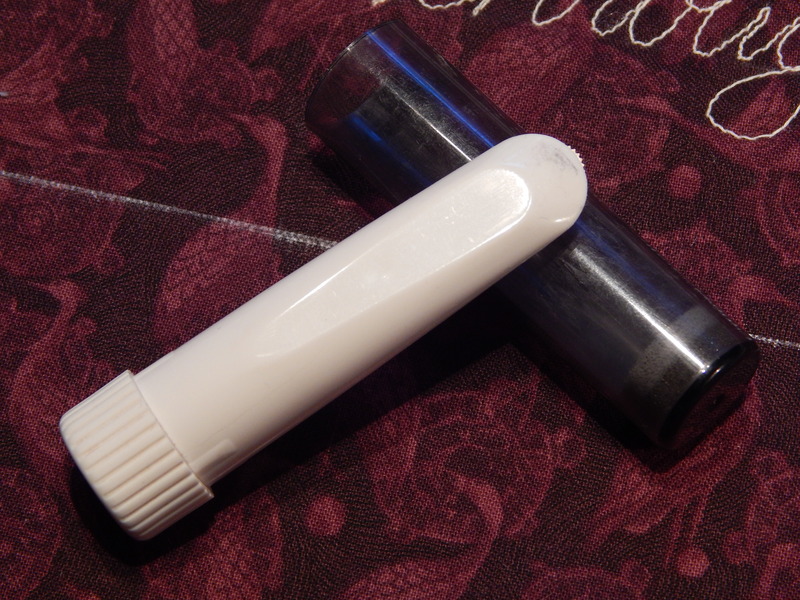 And this is a picture of my favorite little chalk tool. It is a Clover device, and you can see the tiny little gear at the top that lets the chalk out in a very fine line. It draws on cloth so much easier and more accurately than a pencil. And it also erases easily when you are done with it. Sometimes I use the disappearing blue pen, but only when I plan to wash the quilt before I use/sell it. And the finished writing with all the threads clipped. I made the pillows using a very simple overlapping technique. 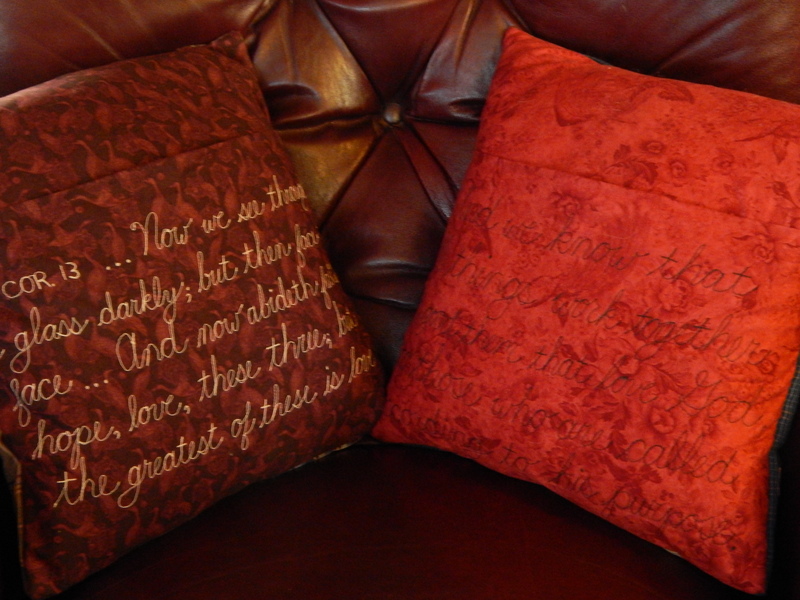 For these 16 inch pillows, each back flap was 12 inches X 16 inches, so there was about 8 inches of overlap. Its a lazy way of making a pillow–no fasteners needed. You might wonder about the verses I chose. I asked my brother and sister separately if they remembered what Dad’s favorite verse was. (Dad LOVED scripture. I knew he had a lot of favorites.) So each of these were verses that Dad loved, but that had special significance for my brother and sister as well. 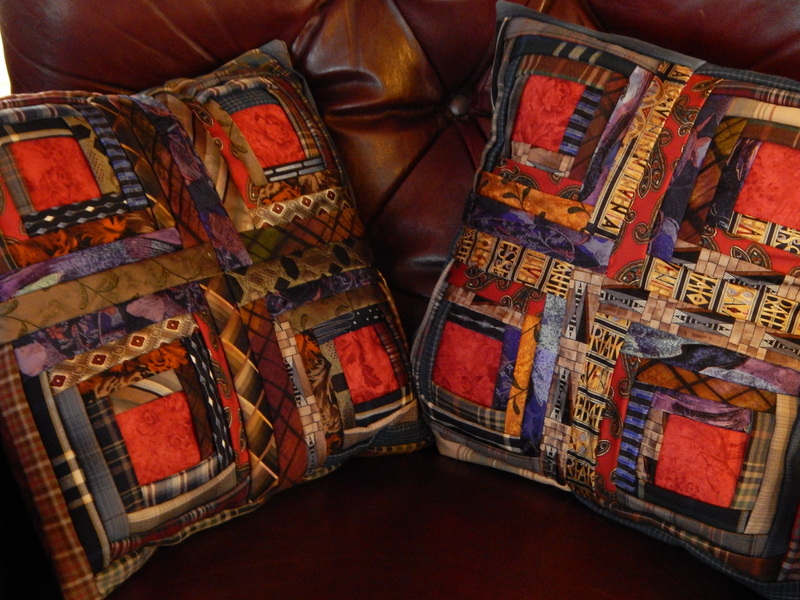 I loved the entire process of making these pillows.